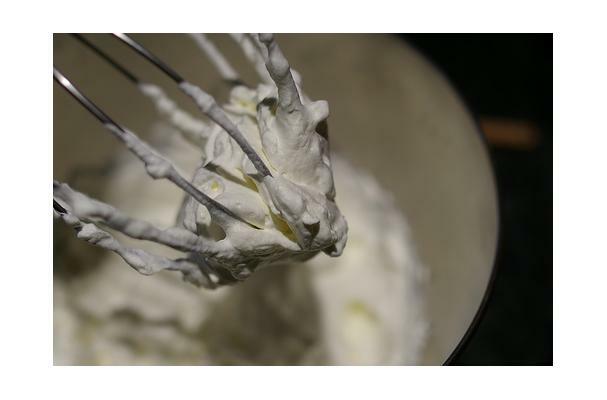 Whipped Cream also known as heavy cream, is a soft solid cream containing 30%% milk fat, and is made by whisking or mixing air into the cream. Whipped cream is used as a decoration on cakes or a dessert topper for ice creams or sundaes. Whipping cream's volume is roughly double that of the original cream due to the air bubbles created by the whisking process. It holds shape well, but confectioner's sugar is sometimes added to stiffen the mixture. Choosing: Use cream that has either a 36 to 40 percent milk-fat content (heavy cream) or 30 to 36 percent (light whipping cream). Buying: Whipping cream is widely available at supermarkets. Use cream that has either a 36 to 40 percent milk-fat content (heavy cream) or 30 to 36 percent (light whipping cream). Refrigerate. Whipping cream will spoil after one to two weeks.